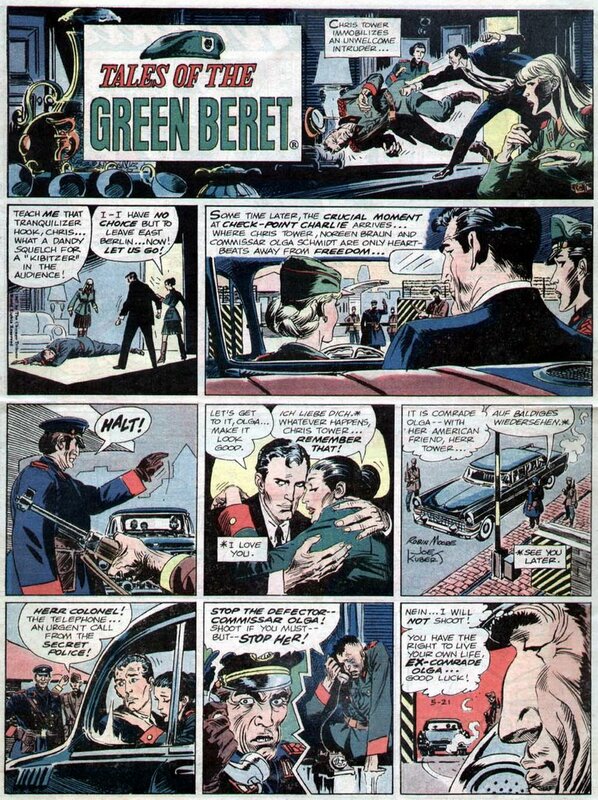 We covered the Tales Of The Green Beret strip a few days ago; here's another comic strip casualty of the Vietnam War. 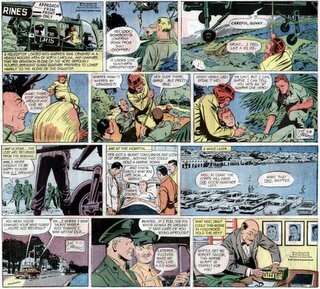 Dan Flagg, a strip about a Marine troubleshooter, was created by Don Sherwood and syndicated through McNaught Syndicate starting 4/22/1963. According to an article in Menomonee Falls Gazette #103 Al McWilliams began ghosting the art "almost from the start" of the strip. The strip was real hardboiled adventure stuff, the sort of thing that would have been right at home appearing in Soldier Of Fortune magazine. For this reason it didn't find a huge number of newspapers interested in it, but it did get a semi-respectable list at the start. The client list, though, seemed to bleed off pretty fast. The strip is already getting really hard to find by 1964. The strip changed syndicates from McNaught to Bell-McClure sometime in late 1965 or early 1966, presumably a matter of Sherwood looking for a syndicator that could breathe new life into the client list. If anything the opposite happened, because until I stumbled upon the samples above a few days ago, which are from May 1966, I'd never found a single strip printed later than early 1965. The strip was last advertised in the Editor & Publisher Syndicate Directory in 1967. Presumably the strip lost the remaining client list as public dismay over the Vietnam War increased. Has anyone seen an example from 1967? Can anyone supply an end date? Looks like July 15 1967 was the last strip, appears Don Sherwood lived in Oneonta and they carried it until the end. I too heard that Don passed away on Saturday, in Charlotte, NC, but have been unable to verify by any newspaper accounts or obits. If someone does find out this information, would you please post where and which newspaper it can be found? Thank you. Don was a very nice man and I had a few laughs with him. Just heard today that Don Sherwood has passed away, but details are sketchy. Am preparing an obituary for local newspaper, and would welcome any details anyone has, either about where and when he died, or stories and memories about him. Please e-mail jkevlin@thefreemansjournal.com. We go to press the evening of Tuesday, March 23.
care of the staff at Levine and Dickson Hospice House in Huntersville, NC. A funeral service and burial is being scheduled at Arlington Cemetery. Don spent much of the last few years here in Boston amoung friends. Oh, what a great strip. Herriman's Stumble Inn ran 10/30/1922-1/9/1926. 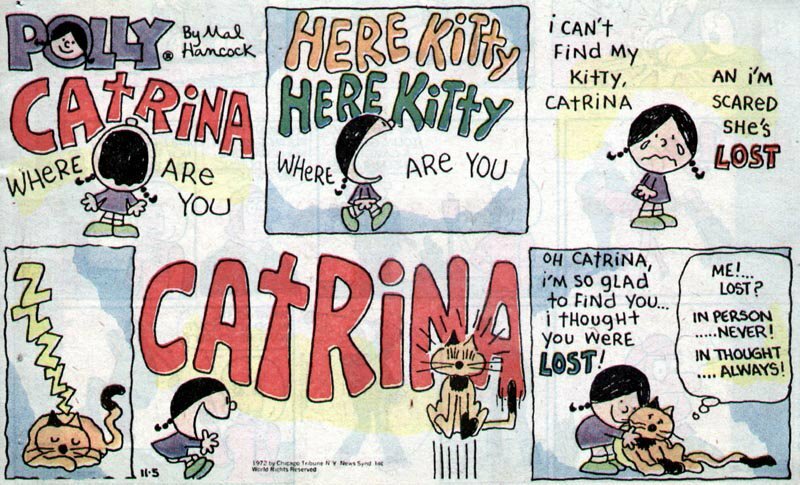 For those of you who love Herriman's artwork but consider Krazy Kat a little high-falutin' for your tastes, this one you'll really love. Not much to say on this post, just thought it was about time to throw some of the master's work out there... Enjoy! Man, can you believe the amount of writing in those word balloons? my first comment, from old Europe. First of all, thanks so much for such great amount of very good information on comics strips. I enjoy your blog a lot. About Herriman, I would like to know whether somebody has listed his works (title, runs, popolarity, and so on). Patrick McDonnell's book would be a good start. Yes, McDonnell's book is good, and I have a copy I got years ago (I had forgot). I let you know what I learn. 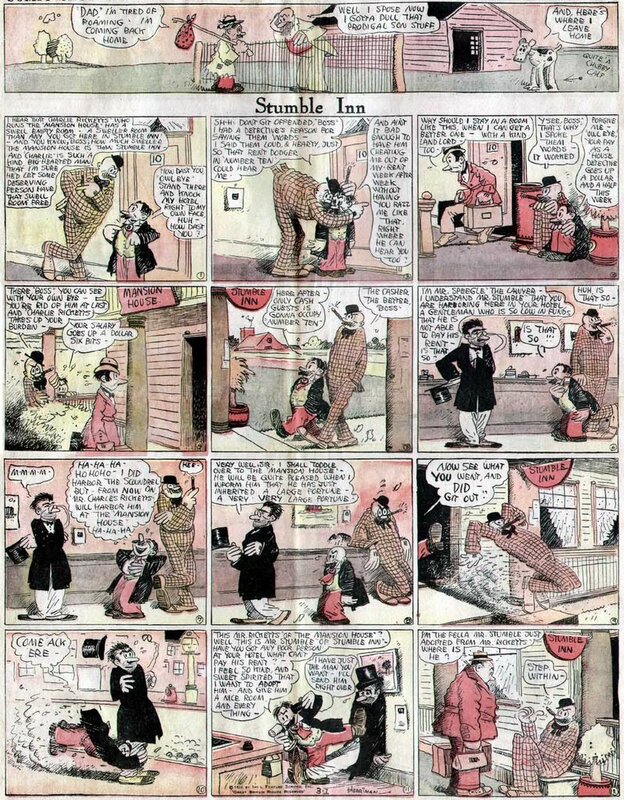 Also, I am in the process to buy some old newspaper comics pages which include a Krazy Kat strip (from 1913-1916). If you have any advise on how to start a little collection, please let us know. Found at last! I've known that this feature existed for years, but only from hearsay. I finally found documentary evidence - it ran in the Philadelphia Inquirer for just a couple months in 1979. Richie Rich was a comic book put out by Harvey Comics starting in 1960. The comic book was very successful, but this strip certainly wasn't. The concept seems like a natural for the comic page, but there must have been some monkeywrench in the works because it took me ten or so years of looking just to find a single paper that ran it. Maybe those of you who know comic books can help me with the credits on the strip. It is signed "Warren Kremer/L. Herman". Can someone tell me which one is the artist and which is the writer? Does anyone know the specific running dates of the strip? Can anyone verify the existence of a daily version (both daily and Sunday were advertised, but I've only seen the Sunday)? My notes say it ran 1979 to February 1980. I would have to check my records to see where those dates came from, but I just don't have time right now. Thanks for the info guys! D.D., if you ever get a chance to check your source for that Feb 1980 date I'd reaally appreciate it! I've seen one daily sample. Warren Kremer was the artist. He recently died in 2003. Lennie Herman was the writer. He died in the 80s sometime. If you have other samples, I'd love to see them. I publish a fanzine on Harvey Comics called "The Harveyville Fun Times!" and my website is at http://thft.home.att.net. Sorry, Mark, but for strips that are still in copyright and especially for characters still in active use, I mostly limit myself to showing one example. I figure that much is reasonable under fair use, but I don't want the corporate lawyers to get their dander up at me. while Mark is the expert on Harvey Comics, Warren Kremer didnt do much inking on his own pencils by this time (if he did any). As with the Green Beret note, I can't find my records for Richie Rich. Will continue to try dig it up. What can I tell you about Albert Carmichael? Of his life, essentially nothing. I know that he is rumored to have died in 1917, a victim of the great influenza epidemic. That is the breadth of my knowledge of his life. Of his art I can tell you more, and it is, I think, an intriguing story, tantalizing in the possible answers to the mysteries involved. The bare facts are these; Albert Carmichael's first known published work is a strip titled Why Be Discontented? that ran just a handful of times in August 1907 in the New York Evening World. The strip was nothing memorable, and Carmichael's art was rough. Carmichael may have been freelancing, because he continued to appear in the World on occasion but not nearly often enough to indicate that he had a steady job. Perhaps he did, though; often newspaper artists were kept busy with photo retouching, drawing maps, and the many other less glamorous art jobs that a newspaper affords. The interesting thing about Carmichael's cartooning work at the World was that it began to look more and more like the style of George McManus. And since McManus was one of the star cartoonists at the World, that may very well mean that McManus had taken young Carmichael under his wing and was tutoring him. As time went on, Carmichael's art becomes almost indistinguishable from McManus'. By 1910 or so something amazing was happening - Carmichael, though still closely mirroring McManus' style, began to surpass the master. McManus' work at this time, though excellent in its own right, was still hampered by minor stylistic flaws, occasional questionable draftsmanship, and a certain cookie-cutter approach. Meanwhile Carmichael was honing the style, making his line more fluid, his characters move better, his draftsmanship becoming impeccable. McManus' art, meanwhile, does not likewise progress. In 1912 McManus finally responds to the siren call and wide open coffers of Hearst. Hearst, since the 1890's, had made a habit of not nurturing talent from within his organization, but instead simply wooing away the best people from other papers. On McManus' departure his flagship World strips The Newlyweds And Their Baby and Spareribs And Gravy are reassigned to the obvious choice - who else but Carmichael to be his successor? Carmichael takes over the strips, now a valued newspaper cartoonist of the first rank. However, he is not allowed a byline on these new strips, and rarely does his signature on them survive to be printed in the paper (but we do know he signed them from the original art that pops up from time to time). Laboring in virtual anonymity, Carmichael continues to enhance his cartooning skills, now producing a version of McManus' style that clearly overshadows the originator. Over at the Hearst camp, McManus gets off to a slow start but finally hits the bullseye in January 1913 when he creates Bringing Up Father. 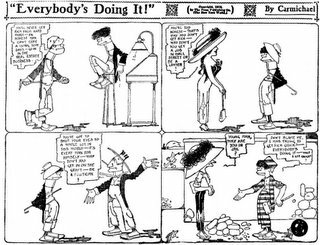 McManus continues trying out other strips for several years, but by 1918 Jiggs and company are firmly entrenched as his claim to fame. In December 1916 Carmichael's version of The Newlyweds And Their Baby comes to an abrupt halt at the World. Whether for lack of interest or because of the rumored impending death of Carmichael I simply don't know. In any case, Carmichael's work for the World ends, and he does not go anywhere else that anyone has been able to find. The eerie conclusion to the story is that starting around 1918, a year after Carmichael's presumed death, we start to see a change in McManus' art style. It begins, ever so slowly, to take on the qualities of Carmichael's art. Over the next half a decade or so, McManus hones his own skills in the same direction taken by his former impersonator. By 1925 or so McManus has shaken off all the rough edges and bloomed into his elegant yet superbly comedic mature style - a style that looks very much like Carmichael's. Is this simply the natural progression of a cartoonist? Or is it some sort of tribute to the fallen student who surpassed his master? Or, if we prefer a supernatural explanation, could Carmichael have been reaching beyond the grave to guide the hand of his mentor? Any biographical information you can share about Albert Carmichael would be most enthusiastically and gratefully received. Oops - almost forgot. 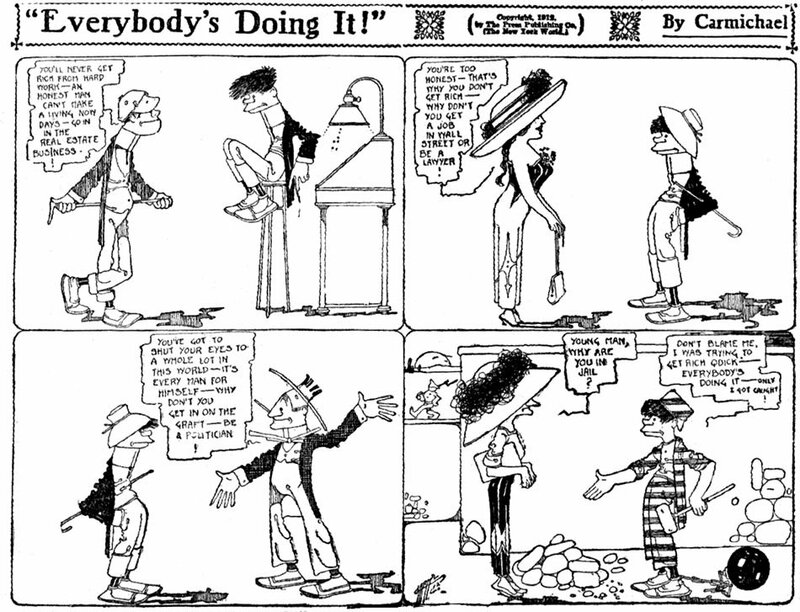 The sample strip above was published in 1912, not long before Carmichael took over McManus' strips. As the Vietnam War began to heat up, author Robin Moore's war novel Tales Of The Green Beret became a bestseller. 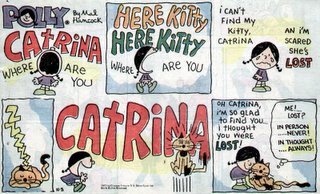 In 1966 the book was used as a springboard for a comic strip of the same name. The strip, supposedly written by Moore (but actually written by yeoman comic strip ghost-writer Elliott Caplin) was introduced to newspaper readers on April 4, 1966. Sporting art by the master of hard-bitten war comic books, Joe Kubert, the strip was an instant success. Kubert's art style was perfect for the strip - every bit as gritty, bloody and terrifying as the real thing being broadcast on the evening news. As casualties quickly mounted in Vietnam and the anti-war movement gained traction, newspaper editors started to think twice about running a comic strip about the Vietnam war. Presumably it was lagging strip sales that caused Joe Kubert to jump ship after a little more than a year and a half (his last Sunday was 1/7/68, his last daily in mid-week on 1/10/68). John Celardo took over the art, and as good as he might be, he just couldn't maintain the intense flavor of Kubert's version. The strip limped along, losing papers fast, and was finally put out to pasture on July 21, 1968. Do you recall where you heard the rumor? That's a new one to me. But where I originally found the dates, I don't know at the moment. Thanks, Anon, for the info. I have access to that paper. The actual dates are 9/27 - 12/18/65. Definite proof that NEA had it before the Trib, and the ones I looked at do seem to be different material. I'm trying to find a newspaper that ran Tales of the Green Beret after 1/20/68 - anyone know of any? Thanks Allan - Is that newspaper available online? I didn't find it on Newspaper Archives or Google Archive. I don't know if it's online, I reviewed it on microfilm and bound volumes. 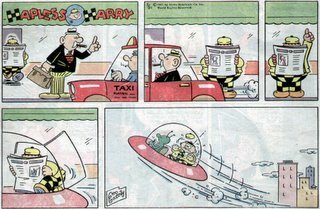 I know this post is over 10 years old, but as I've been doing a bit of research on this strip I thought I should correct a couple things. One, according to Kubert, the ghostwriter on the series was Jerry Capp, Al and Elliot's brother. Two, though you speculate lagging sales were the reason he left, Kubert claims to have left due to creative differences with Capp. George Gately is well-known for his tremendously successful cat feature Heathcliff. Far more obscure is his first syndicated strip, Hapless Harry. Hapless Harry ran 1/11/1965 through sometime in 1971 (my latest is 6/6/71 - can anyone verify a later date?). It was a strip about an everyman nebbish; the hook for the feature is that it was done mostly in pantomime. Pantomime is a hard form for the cartoonist, and Gately's strip was always serviceable but seldom great. Newspaper editors tend to like pantomime strips because they can easily be dropped in favor of ads when necessary. Story strips, of course, can't be dropped or the readers will miss a day's action in the story. Gag-a-day strips are easier to drop, but the easiest are pantomimes. Why? Because they are such a quick 'read' that people tend not to miss them when they disappear for a day. Anyway, Hapless Harry did not take off at all in syndication. The New York News ran it, and they are such a high paying venue that it kept the strip alive practically all by itself. If not for that paper I doubt that the strip would have lasted more than a year. 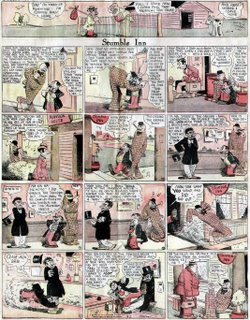 Mal Hancock created quite a few syndicated comic strips, the first we know of being Nibbles that ran 1960-63. 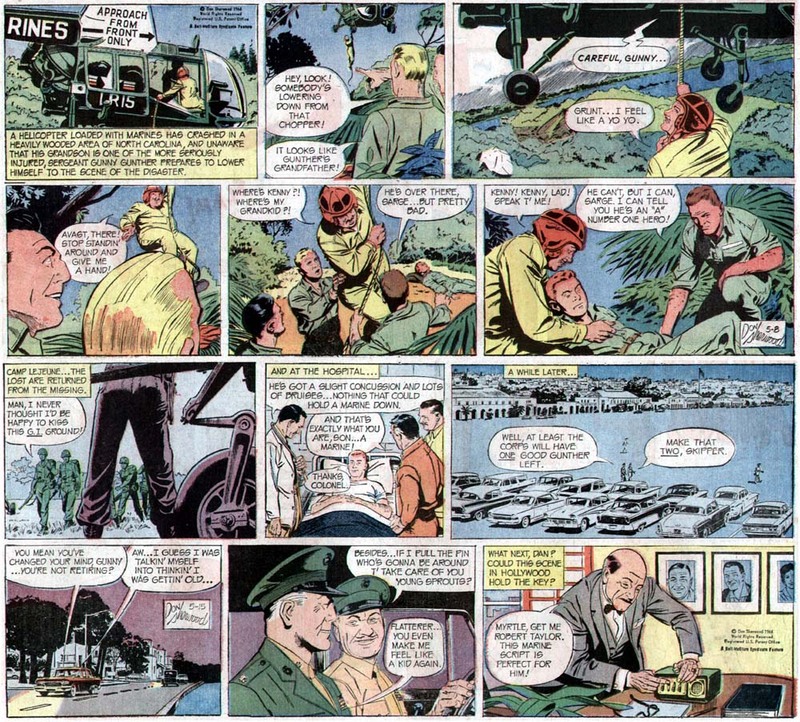 All of Hancock's series from the 1960s were done for the George Matthew Adams Service (Washington Star Syndicate after they bought out GMA). This syndicate was always limping along, rarely getting any of their features in a lot of papers. So it must have been exciting for Mal when he sold Polly to the Chicago Tribune-New York News Syndicate in 1972. Finally a chance at making some serious syndication money! Unfortunately it was not to be. Polly ran from sometime in 1972 (anyone have a specific start date?) until 5/25/1974, never having caught on with newspaper editors. Perhaps Hancock's naive style, which he used on all his features, just wasn't what a lot of newspapers were looking for. Hancock's longest running, and presumably at least modestly successful, strip was The Fantastic Foster Fenwick, which ran 1968-1982. Mal Hancock is often confused with Mal Eaton, the two of whom shared a signature of "Mal" and had styles that were a bit similar. Not immune, in researching this little essay I discovered a mistake in my Stripper's Guide listing where I assigned one of Hancock's features to Eaton. Oops!